The market is indeed expensive. However, I will continue to add more to companies since my focus is more on acquiring income instead of timing the market for capital gains. If my holding falls in share value, I am not at all concerned as long as their income continues to grow. Since my time frame is in 30+ years, I do not plan to sell my holdings and am only concerned with the earnings or cashflow supporting the dividend payouts. Right now, I have 3 brokerage account. I use Fidelity for my Roth IRA, Capital One for my Taxable account, and my employer's retirement provider for my 401k. As of 7/31/2016 my portfolio holdings are the following below. The top positions are highlighted green because those are my core positions with the highest quality. Quality is determined by financial strength and safety. These companies are usually larger, have long track records, strong moats, have strong balance sheets, and have been paying dividends for a long time. The green companies in the middle are still high quality but have lower ratings. Yellow and Red companies are what I consider Supporting and Speculative positions. I have added new positions in Medtronics (MDT) and Stryker (SYK) in the healthcare category. My top 5 heavy weights are JNJ, MO, O, PM, and T.
My current asset holdings is on track with my plan. 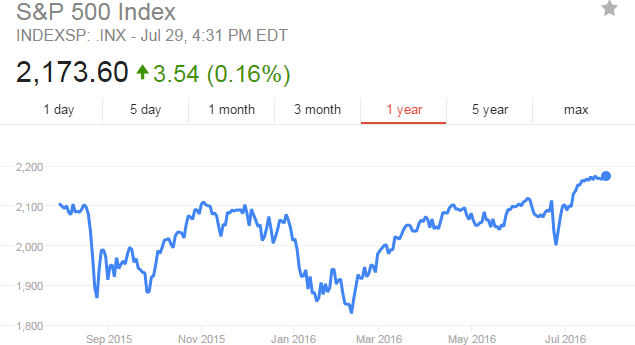 The portfolio has had a nice run up lately due to capital gains from rising stock prices. This may be temporary of course. Even if a correction occurs I still believe my monthly income can help offset the losses. The goal is income accumulation, not so much capital paper gains. In the previous blog post, I highlighted that in July 2016 I have received $444 in dividends. This is a large raise over the $309 I received last July. Income continues to grow month after month. Stay tuned for next month's report. Well done YD! I love the last graph showing 'goal vs results.' That is such an informative graph showing your diligence over the years. Keep it up! I'm afraid that the market won't keep up its share of the work, but you are well on your way! Great job YD! 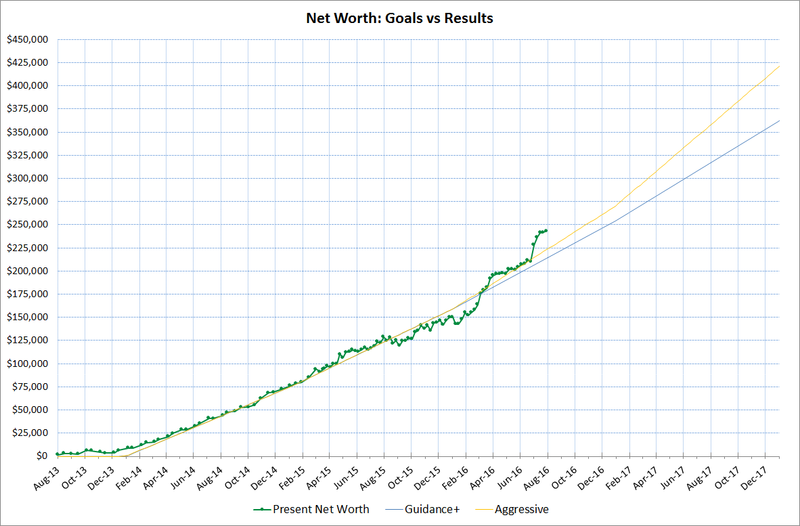 The markets surge higher has really boosted our net worth so far this year which is fun to watch but I wouldn't be surprised to see it drop because the market sure does look expensive. That doesn't mean that you can't find value out there but it's much harder to find now a days.